This stage pertains to the way children move their bodies using large muscles like arms and legs to crawl, walk, run and dance. It also includes small muscle development that helps children feed themselves, scrabble with crayons, paint and write. This stage focuses on the ways children learn about themselves and how to get along with other people. As children mature emotionally and socially, they gain self-control. Their emotional and social development is further enhanced when they engage in creative displays of self-expression. Addresses how children go about learning new skills and concepts rather than what skills and concepts they learn. Children approach play and learning in a variety of ways. They are curious about their world and show this by “getting into things” putting their hands in their food, toys in their mouths, stacking things up and knocking them down. 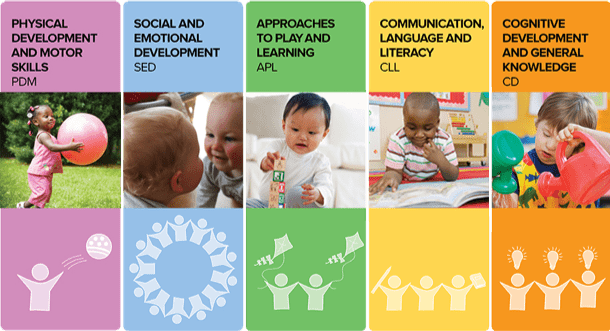 Development involves the way children learn to communicate with sounds, words and gestures, and the way they learn to read and write. This involves bother verbal and nonverbal behaviors. Addresses how children use their minds to explore the world around them. They should be encouraged to explore, investigate, and observe. Social Studies encourage the development of meaningful knowledge about people, jobs, etc. Creative Arts to include drama and music provide opportunities for individual ideas, feelings and expression. A child’s spiritual development is a personal matter. Your child will decide on her or his own when and how they will begin a nurturing relationship with God. We have a responsibility to teach and demonstrate spiritual principles that are the foundation of family life. Talking with children about God as we go about daily business. Discussions should be routine and natural. The trust they have in their earthly parents can be expanded to their heavenly father.